Welcome to my inaugural GIVEAWAY! I’m very particular about journaling and keeping a record of things – which is one of the reasons why I enjoy blogging so much! I believe it is important to actually write down (a) our goals and (b) see our progress in obtaining those goals. Seeing your goals in writing is very motivating and it is even more motivating to see your progress and watch your dreams become a reality! I journal about many things on a regular basis – running included (in fact, it’s my favorite thing to keep track of! ), therefore keeping a training log is a top priority for me. In fact, I have been keeping a log since I started running, but it has not been until midway through last year that I found the perfect log. I like this log for many reasons and never hesitate to recommend it to my fellow runners (or those non-runners that I am trying to encourage to run!) because of it’s simplicity and unique detail. I’ve tried many many logs – online sites, paper, and mobile – and none of them compare to this log. It’s pre-dated for the whole year. I don’t have to worry about making sure I don’t skip a date and mess up the entire log! It’s small, thin, and compact, but there is plenty of room for all of my notes! I can’t stand logs that offer minimal writing space when I have important things to say. 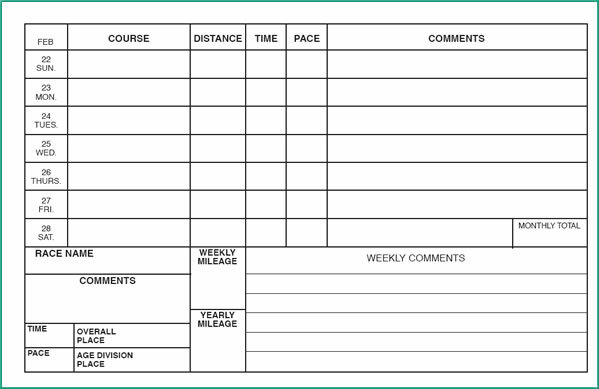 This training log has space for daily and weekly comments so I can get all of my details about my runs in somewhere – without having to cram! It has a space for course, distance, time, and pace. All the essential details of my runs. It has a place on each page for monthly totals, weekly mileage, and yearly mileage. No more going back to January in August trying to figure out if I am making my mileage goals. Plus, I enjoy watching the miles rack up from week to week! And quite possibly my favorite feature? 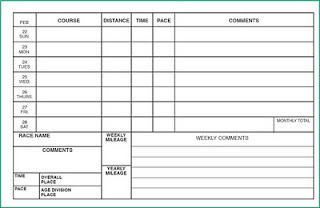 The log has a space each and every week for race information – Race Name, Comments, Time, Pace, Overall and Age Division Place. Keeping track of races and performance is really important to me – I see my PR’s and I want to keep working harder to accomplish new ones! Each page features one whole week in a spiral-bound notebook that is both light and durable making it ideal to carry with you in a purse or running bag. I take mine on the go from time to time if I need to update more than a day or two. It has a Pace Chart in the back for race distances from a 5K to Marathon for quick reference. As I said, it’s perfect! You will never use another log again! It is important to keep track of our goals in a place where we can go back and review them from time to time, which helps hold us accountable and obtain what we set out to do. It’s empowering to actually write it down instead of letting Garmin do the work or cut and paste on your computer screen. It’s almost a new year, why not a new training log? Besides being kind and offering quality customer service when I ordered my own log, Phil at www.sportechtraininglog.com was more than generous to send me a few extras to give away to you! In fact, I will select three winners via random.org and not only will I send a log for you, but I will also send a second log for your training buddy or friend. A special thank you to Phil at www.sportechtraininglog.com for making it possible for me to give away such an awesome product on my blog! already a follower. love your blog. your such an inspiration. to run at least 11 races in 2011. wasn’t able to reach my goad for 2010 due to finances, much more challenging than i imagined. I love the heart and inspiration that is put behind everything on your blog. Wooohoo!! Congrats on your first official giveaway… I’m excited that I get to enter =)! I’m a follower! Added giveaway link to my blog! 2011 running goal: To complete a half marathon! Feature I love? I love a journal – just writing it down and being able to flip thru pages and compare notes is awesome. The pace chart would be handy to have around! One of my goals is to maintain my mileage over the winter. This is hard for me since I’m less motivated by treadmill running so I signed up for an early spring 10K to keep myself prepared! Goals for 2011 ~ Set a marathon PR and finish the 24 hour run in March. I like that there is still plenty of room for comments on the training log.